The Diagnostic and Statistical Manual of Mental Disorders now recognizes six primary feeding and eating disorders including pica, rumination disorder, avoidant/restrictive food intake disorder, anorexia nervosa, bulimia nervosa and binge-eating disorder. Guided by research from the past 3 years, the current review outlines diagnostic criteria for each disorder, their clinical correlates and treatment options. Recent modifications to diagnostic criteria will likely help to improve treatment outcomes and prognosis. Nevertheless, several concerns remain regarding the validity of current diagnostic criteria for youth, including the clinical relevance of the size and frequency of binge eating episodes. Additionally, the lack of randomized controlled trials has led to an overreliance on data from quasi-experimental studies, case series and single case studies that impede development of strong clinical recommendations for treating feeding and eating disorders. Recommendations for future research include identifying empirically supported treatments and prevention programs focused on early markers of pediatric feeding and eating concerns. The opinions and assertions expressed herein are those of the authors and are not to be construed as reflecting the views of the U.S. Public Health Service, the Uniformed Services University of the Health Sciences, or the U.S. Department of Defense. Nichole R. Kelly, Lisa M. Shank, Jennifer L. Bakalar and Marian Tanofsky-Kraff declare that they have no conflict of interest. Magallon-Neri E, Gonzalez E, Canalda G, Forns M, De La Fuente JE, Martinez E, et al. 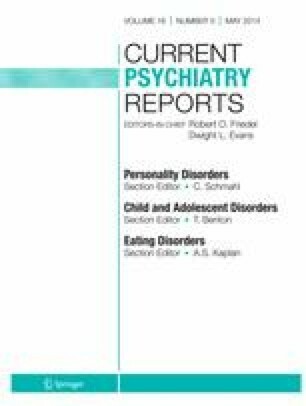 Prevalence and severity of categorical and dimensional personality disorders in adolescents with eating disorders. Eur Eat Disord Rev. 2013. doi: 10.1002/erv.2268. Faje AT, Fazeli PK, Miller KK, Katzman DK, Ebrahimi S, Lee H, et al. Fracture risk and areal bone mineral density in adolescent females with anorexia nervosa. Int J Eat Disord. 2014. doi: 10.1002/eat.22248. Wildes JE, Marcus MD, Cheng Y, McCabe EB, Gaskill JA. Emotion acceptance behavior therapy for anorexia nervosa: a pilot study. Int J Eat Disord. 2014. doi: 10.1002/eat.22241. Lang K, Stahl D, Espie J, Treasure J, Tchanturia K. Set shifting in children and adolescents with anorexia nervosa: an exploratory systematic review and meta-analysis. Int J Eat Disord. 2013. doi: 10.1002/eat.22235.